So this is turning out to be a better week than it looked like it might be back on Tuesday, what with an impressive debut starts from Mike Pelfrey and Nelson Figueroa; the first Metly appearance and contribution from Raul Casanova; and a continued MVP bid from Angel Pagan. There’s something satisfying knowing that all these guys are one-time products of the maligned Mets farm system. Figueroa’s victory last night marked the first appearance of the dreaded black unis all season (not to mention the first call for a tailor to get Figueroa’s jersey to fit right. Looked like a size 44 wearing a 52). Correct me if I’m wrong, but we’ve yet to see pinstripes and/or the gorgeous all-blue Mets cap yet. Speaking as a neighbor of hundreds of young hipsters, the latter is becoming the new trucker cap around here: I’ll try and gather photographic evidence and show you in a future post. Nice to see the Mets honor Shea (that’s my wife’s maiden name, doncha know?) but leave it to the incomparable Paul Lukas to point out they did so while introducing unnecessary black dropshadows to the logo and accompanying retired numbers. * Thanks to Eric Simon of Amazin’ Avenue (and his readers) for the enthusiastic book review he published recently. See also a nice note from author, reviewer and Yankee fanatic Harvey Frommer. And Mark Lelinwalla of the NY Daily News did a short peice on the book’s creation in The Score column last week. * I’ll be at two great independent bookstores next week to sign and discuss the book: On Wednesday, Bookends in Ridgewood, N.J.; and Thursday at Word Books in Greenpoint, Brooklyn. On the first day active rosters can be expanded the Mets as expected recalled AAA starters Mike Pelfrey and Phillip Humber, along with a lefty reliever, Willie Collazo.Pelfrey to wear No. 34 as usual, will try for his first victory of the year in a start this afternoon in Atlanta. Humber will wear the same No. 49 he wore last season in brief appearances. Press notes say Collazo will debut in No. 36 — a jersey that earlier this year went to outfielder Chip Ambres. Ambres reportedly is among others who may still be recalled as the month rolls on. The Mets in the meantime put together a solid game Friday in ending an ugly five-game losing streak. Among the casualties of the Philly sweep was Orlando Hernandez, who is expected to miss his next turn in the rotation resting a sore foot. The leading candidate to take his place is some guy called Martinez. Yet another struggling outing Saturday left Mike Pelfrey 34 with an 0-5 record and a ticket to New Orleans. The Mets demoted the lanky righthander and in his place recalled outfielder Carlos Gomez, who according to the Mets, will wear No. 27 for this afternoon’s game. Gomez was leading the PCL with 17 stolen bases and could be seen in the short term as insurance for Moises Alou 18 and whatever joint is troubling him this week. Gomez is poised to become the 24th No. 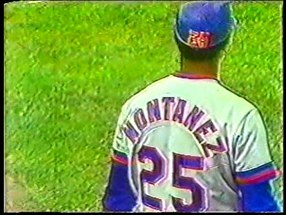 27 in Mets history. Darren Oliver wore 27 most recently. The Mets’ first in-season personnel move of 2007 comes as no suprise: Mike Pelfrey 34 has been recalled from St. Lucie to take over the vacant 5th starter role while outfielder Lastings “I’ve Got to Get My Grown Man On” Milledge 44 reports to AAA New Orleans. Worthless Bonus Fact: The Mets debuted Nos. 34 and 44 on the same memorable day, April 28, 1962. That afternoon, in the Polo Grounds, the Mets were trailing 5-1 to the Phillies when righthander Dave Hillman took the mound for the Mets wearing 34 for the first time, and promptly surrendered a home run to the first batter he faced, Don Demeter. Hillman, a former Cubs, Red Sox and Reds pitcher, had been purchased by the Mets prior to the homestand a day before as part of their very first series of in-season roster moves. Along with Hillman was catcher Harry Chiti, famously acquired from Cleveland for a player to be named — himself, as things turned out, and Sammy Taylor, a disgruntled former Cub catcher acquired in a trade for outfielder Bobby Gene Smith. Taylor by the way was dressed in Smith’s former No. 16, making that trade the first Uni-Swap in Mets history. In addition to Smith, gone were the ancient back-up battery of former New York heroes Clem Labine 41 and Joe Ginsberg 12, who were released. Now back to the game: Chiti, christening the No. 44 jersey, entered the in the 7th inning as a defensive replacement for Chris Cannizzaro, who had been pinch-run for while the Mets hit three home runs (by Frank Thomas, Charlie Neal and Gil Hodges) and scored an astonishing 6 runs in the bottom of the sixth, taking Hillman off the hook and giving the Mets a 7-6 lead. (Hillman was pinch-hit for that inning by Taylor, who walked and was himself pinch-run for. Casey loved that kinda stuff). 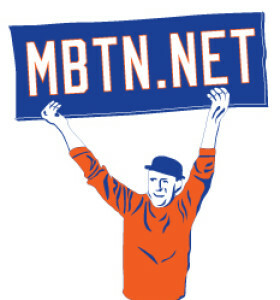 The Mets hung on for an 8-6 win, only their second of the year against 12 losses. Though Hillman was technically the pitcher of record at the time the Mets took the lead, credit for the win went to Roger Craig 38, who pitched three scoreless innings of relief to nail it down. As Pelfrey prepares to meet the Nationals tonight, and Milledge returns to the place he started, here’s to happy first transactions. By now everyone knows the Mets will be Pedro-less for the playoffs but let’s be honest: That doesn’t surprise us. He hasn’t been healthy for a long while, and though it would be nice if the Real Pedro was with us, we’ve been more concerned about the lineup than the pitching all year long, even while they made it look easy and now, especially, as they make it look difficult. The only time they’ve had more was in 1967 (38 active). Too bad they didn’t recall Henry Owens & Alay Soler, they could have tied their franchise record! The only other players left on the 40-man are Matt Lindstrom & Ruben Gotay. Backup catcher Mike DiFelice isn’t much of a player, and isn’t likely here for long, therefore fulfilling the two requirements of the men who wear the No. 6 jersey, Wally Backmannotwithstanding. (Thanks to the several readers who wrote in to point out his uni number today). For the record, DiFelice becomes the 32nd guy to wear No. 6, which is remarkable considering the Mets have had 44 years to find a longtime tenant. It also extends 6’s lead for most frequently issued over 34, which has been given out 30 times already but dealt a potentially hard blow with the recent Mike Pelfrey promotion. Coming on strong, much to the consternation of Met fans and certain of their broadcasters, is 17 (29 issues) continuing to be a questionable destination for bombs like Dae Sung Koo and Jose Lima.